This is my first post. I looked around on the net for awhile and came across this board - looks to be the most competent, so here goes. I managed to get my hands on an old computer monitor from my old school which I found in the celler one day I was looking around. Principle said I could take it. I am a very nostalgic person(sometimes! ), so I was absolutely thrilled because this monitor is able to switch between green monochrome, amber, or normal colors which I thought was very cool, specially was DOS. Monitor was and still is in prestine condition. There is however one problem! I have been unable to stretch the picture to the edges of my screeb. Vertically was no problem. The little knob or whatever for the vertical adjustment was simple not there! I finally came around to take the monitor apart and see what was what. I found out all the adjustments(which were in the back) had simillar mechanisms EXCEPT the vertical one.. Apparently also, someone else had also tried to adjust it, but they seem to have perhaps, I dont know, broken it. I thougut I would ask my friend who fiddles with electricity whenever he has time to look at it. He thought it best to remove the part and see if we could find a replacement either at some TV/repair store or on the net. Problem is however we dont have a clue what the part is called so no results so far. Here is a picture of the part. Any information you could give me on how to fix - how it works. Or best; where I could get a new one would be sooo good. A name for it would most likely also help. I dont know how specific these parts need to be, if some of you have a couple in your spare parts drawer I would love to buy one of you. I have obviously called all official product and customer help but without help as this is such an old screen. From "infront" atempts to adjust the width have broken or ruined the part as it has what appears to be cracks and the umbraco fit looks just round. The other adjustments I spoke of have different mechanisms as seen here. More simple and can be turned with a normal screwdriver. Actually, your picture looks perfect in the video. Old CRTs did never use the full extent of the tube screen because at the outer edges the picture would become blurry due to the electron beam(s) not hitting the fluorescent matter at a right angle - thus, the area that is lightened up by the beam becomes larger to on the tube edges, thus less sharp. This is intentional and caused by the geometrical limits of a CRT. From your video, I would assume the monitor is perfectly in order. Disclaimer: Do NONE of the following unless you are comfortable with the particulars of a given described procedure!!!! You have been warned!!!!! While I understand that this is a rather old question, I feel that I can add important information not previously mentioned. I have widened the image beyond what the factory adjustments would allow on at least two dozen monitor chassis, some to widen the image on a stock monitor/tube combination, and other times when I have constructed 26 or 32 inch monitors using circuit boards designed to drive 14 or 17 inch picture tubes. I also should note that, as others have stated, there is likely nothing wrong with the OP's monitor; it was likely designed for a narrow image in order to reduce edge distortion and to guarantee that no over-scan occurs in various modes. 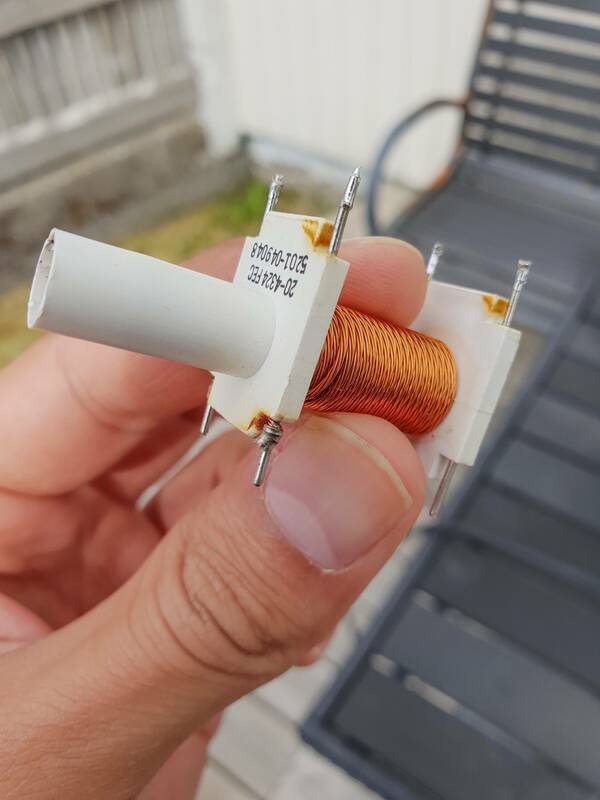 The inductor that is shown in OP's photo is commonly referred to as the "horizontal width coil", and is only one of two devices that determine the amplitude of the voltage driving the horizontal winding in the deflection coil. 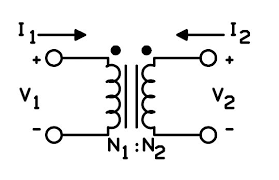 The typical circuit includes not only the horizontal width coil, but also the horizontal width capacitor. While the adjustable coil is used to fine-tune the width of the deflection, the over-all "center" of the adjustable range is determined by the horizontal width capacitor. When the width coil is turned to it's middle range, the capacitor value can be adjusted to increase or decrease the width of the image to an acceptable "starting point", and then the width coil can be used to widen or narrow the image from there. 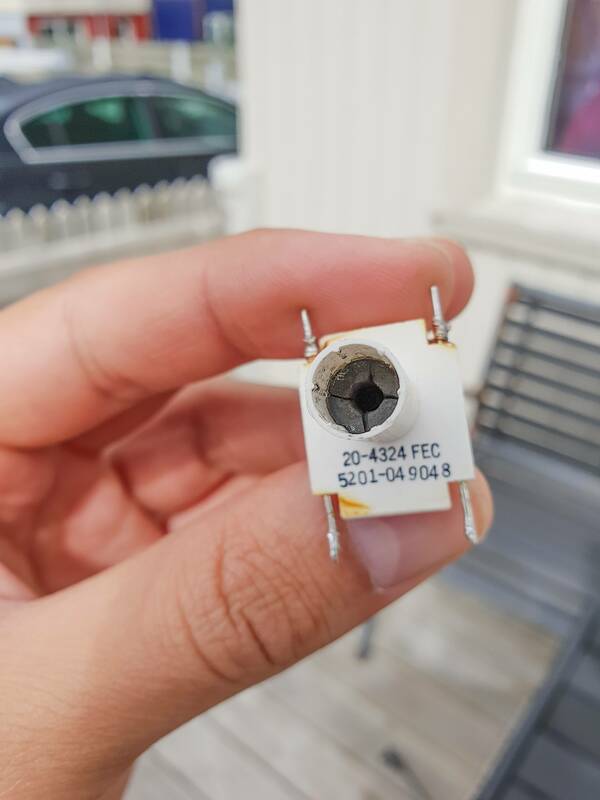 This capacitor is almost always directly adjacent to the width coil, and are always electrically connected to one leg of the width coil. These capacitors are polypropylene type capacitors, and usually have the shape of a full flour/grain sack, or a pillow. 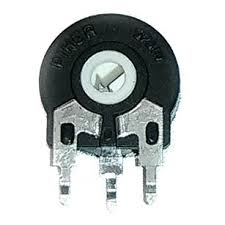 While I have heard that some circuit designs need to have the capacitance lowered to increase the median width, I have personally never come across one of these designs. In every single circuit I have modified, the image was widened by increasing the capacitance of the width capacitor. The capacitance change required can usually be guessed for a rough estimate(for example, a 10% increase in width would require a 10% increase in capacitance), experimentation will almost always be required to get an acceptable medium width. There are two ways this experimentation can occur; one is the safest, but much more work, while the other is more dangerous, but very little work. In both cases, a range of capacitor values with the proper voltage ratings(200 to 400 volts; just match original capacitor's voltage) will need to be on-hand. The first method involves removing the original capacitor and replacing it with an appropriate value, powering down the monitor chassis and discharging all high voltage electrolytic capacitors between each experimental replacement. The second method(as I said, more dangerous and only for the very experienced monitor technician) involves placing much lower value capacitors in parallel with the existing capacitor to increase the total value, all while the monitor is powered, observing the effect on screen width with each test. This works because total capacitance is determined by adding the values of each capacitor in parallel. Using the first method, there are also two different ways that the capacitance can be changed, each way requiring a different range of capacitors on-hand with which to experiment. The first way is obvious, which is replacing the original capacitor with a new value between each power down and discharge. In this case, the range of capacitors required for the experimentation will need to be generally around the value of the original capacitor. The second way would be to parallel an additional much smaller capacitor across the original capacitor by soldering one to the other between each discharge and test. In this second case, a selection of much smaller value capacitors will be required, generally five or so values that are about 2 to 10 percent of the original capacitor's value. To fine-tune this, more than one of the smaller value capacitors can be paralleled with the original capacitor. The second quicker and more dangerous method(safe if you know what you are doing), is to disassemble the monitor in a fashion that it will still have all cables and internal wiring connected that provides access to the bottom of the circuit board, while the monitor is still able to operate. 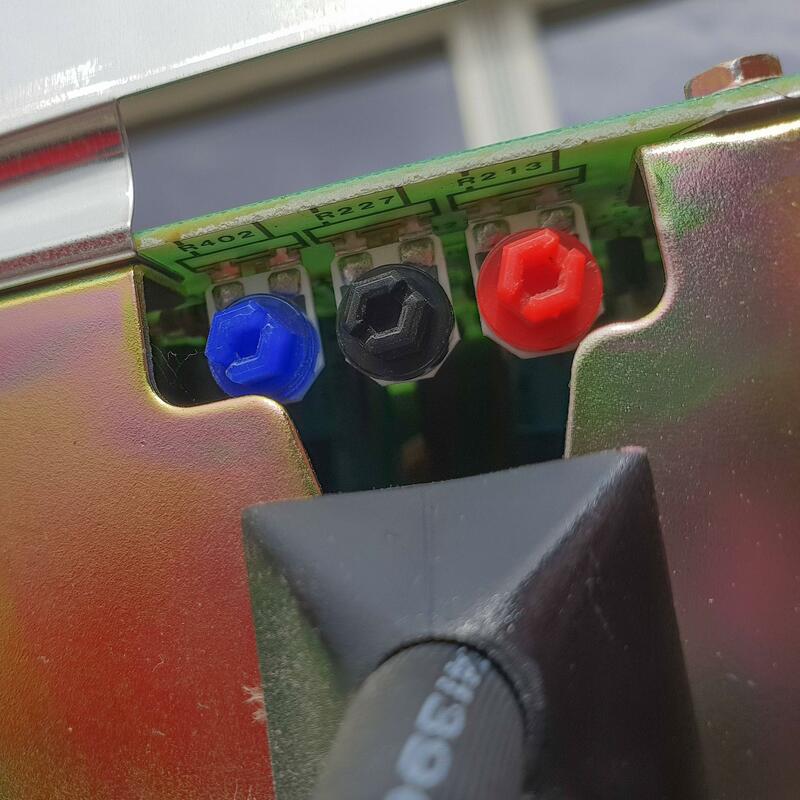 In this case, one would(with the monitor powered down and capacitors discharged) apply solder to the original capacitors solder joints, in order to ensure no laminate exists on top of the original solder joints. Then, with the monitor powered up, one would take an experimental small-value capacitor(starting with the very smallest), and touching it across the solder joints of the original capacitor in parallel, while observing the increase(or decrease) of the width of the image in real time. Once the proper value is determined, the monitor can then be powered down and discharged, and the selected capacitor then soldered across the original capacitor in parallel, either on top of the circuit board(soldering to the protruding legs of the original capacitor), or on the bottom of the circuit board, providing there is clearance for the new capacitor underneath the circuit board once the monitor is reassembled. 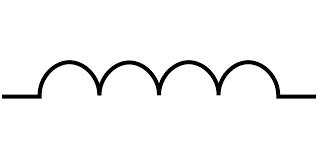 One should also note, that, depending on the design of the original circuit, and the degree to which the width was increased, the geometry of the image may be distorted, notably the pin cushion. Most monitors have addition adjustments for geometry correction, and in most cases(unless the width is dramatically increased), the geometry controls can compensate for geometric distortion. ***As an aside, I will note that I have never had a partially cracked ferrite core(as shown in the image) have any large effect on the performance of the circuit, though it should be noted that the cracking likely occurred by either using the wrong tool(should be hex, and not a screw driver), or by trying to adjust the ferrite core beyond it's designed range-of-travel. 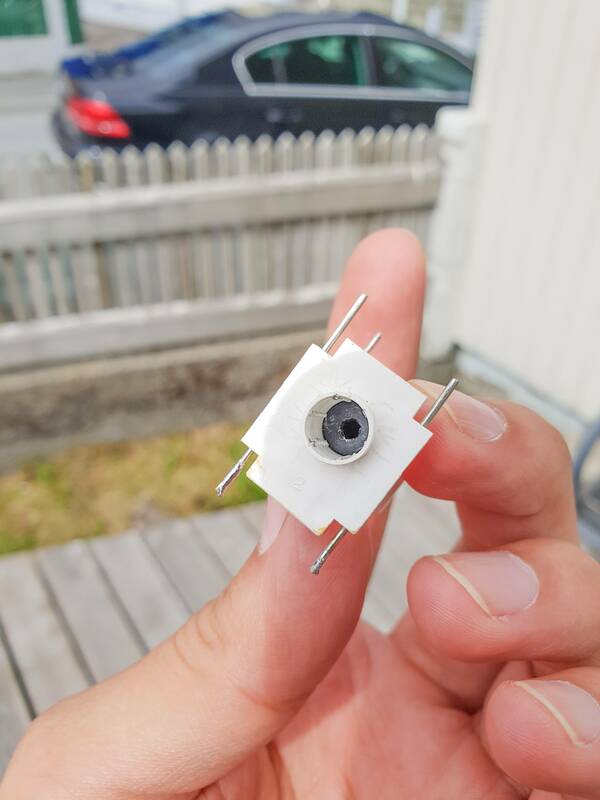 In the latter case, the ferrite core should be re-centered to the center of it's designed range before proceeding with any further modifications. While the horizontal width coil can be adjusted with the monitor running(thus observing the live results), only a plastic hex adjustment tool should be used, as inserting any ferrous(steel/iron) tool into the active coil turns this coil into a tiny inductive furnace, quickly heating the metal tool to dangerous temperatures(would scorch your fingers within a few seconds of inserting said tool), greatly overdriving the circuit and likely blowing the horizontal output transistor. The coil can safely be adjusted with a metal tool(standard hex/"Allen" wrench) only when the monitor is powered down. I will repeat again, don't do any of this unless you are comfortable with what you are doing, and in NO cases place both hands near an active or non-discharged chassis at the same time!!! 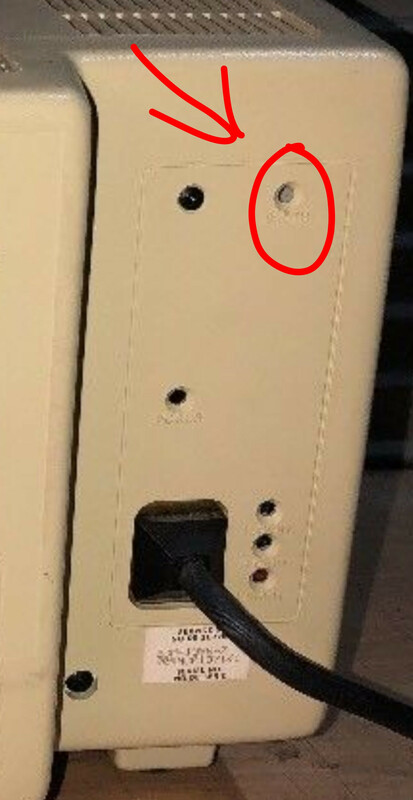 I see only one pin on your image (the one connected with wire) so my bet is you got just 2 such pins and it is not adjustable choke coil. Finding replacement for such will be near to impossible as those are usually custom build by the factory. You would need to repair or build a new one yourself and you are most likely not having circuitry diagram nor a working twin monitor to get/measure the inductance range of valid part nor the ferrite parameters (they differs a lot but looks all the same). Not the answer you're looking for? Browse other questions tagged crt-monitor repair or ask your own question.